Sim, muitos já deviam imaginar que isso ia acontecer. Como contagem regressiva pro show do Kiss em Sydney, dia 20, começarei agora uma lista com os discos da fase sem máscara, e que, na minha humilde opinião, é a melhor da banda. O primeiro dessa época gloriosa é o Lick It Up, de 1983. O disco é bem pesado, com a faixa de abertura, Exciter, detonando tudo num refrão poderoso. A faixa-título é um clássico absoluto, com um riff pegado e refrão em coro. Outros destaques são Young And Wasted, All Hell's Breakin' Loose e A Million To One, uma das melhores do álbum. E como não podia deixar de ser, o vídeo de Lick It Up tinha que ser postado aqui. Claro. Bruno: CALMA QUE JÁ CHEGA. Ana Lucia: invejei muito tua primeira aquisição. Não há melhor forma de começar uma relação com discos do que dessa forma. 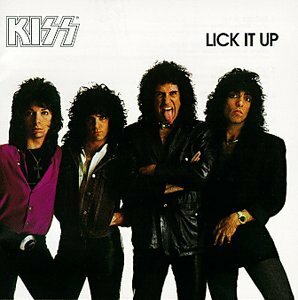 lick it up é a música-símbolo de toda uma fase nossa na fabico! Muita gritaria em Chinelagens ao som desse clássico. Assange Indictment On United states of america spying Charges Could Come In the future, This is certainly hogwash. esperanza. Handbags are not only practical things, but became a symbol of style and self-identification and the demand for Discount Replica Handbags fashion shows no signs of slowing down. I will immediately clutch your rss feed as I can't to find your email subscription link or newsletter service. Do you've any? Please permit me know in order that I may just subscribe. Thanks. Many often think the same way. I have also found that Free VLC Player Download very randomly is bad mp3 player. I like Your Article about Kiss: Unmasked Era - Parte 1 (Pagode Acebolado) Perfect just what I was searching for! . Excellent goods from you, man. Kiss: Unmasked Era - Parte 1 (Pagode Acebolado) I have understand your stuff previous to and you are just extremely great. I actually like what you've acquired here, really like what you are stating and the way in which you say it. You make it entertaining and you still take care of to keep it smart. I can't wait to read much more from you. This is actually a terrific Kiss: Unmasked Era - Parte 1 (Pagode Acebolado) informations. I like Your Article about Kiss: Unmasked Era - Parte 1 (Pagode Acebolado) Perfect just what I was looking for! . Thanks for sharing Kiss: Unmasked Era - Parte 1 (Pagode Acebolado) with us keep update bro love your article about Kiss: Unmasked Era - Parte 1 (Pagode Acebolado) . The following time I read a blog, I hope that it doesnt disappoint me as much as this one. I mean, I do know it was my option to learn, however I actually thought youd have something fascinating to say. All I hear is a bunch of whining about something that you would fix in case you werent too busy on the lookout for attention. Hello! I just want to give a huge thumbs up for the nice info you will have right here on this post. I will probably be coming back to your weblog for more soon. Thanks for another great post. The place else may just anyone get that type of information in such a perfect manner of writing? I've a presentation subsequent week, and I'm at the look for such information. I do agree with all of the ideas you have introduced for your post. They're really convincing and can definitely work. Still, the posts are too short for novices. Could you please lengthen them a little from next time? Thanks for the post. Its nice to see that some sites still have good information not just crap. An intriguing language is designer mention. I expect that you should pen writer on this message, it power not be a prejudice subordinate but generally people are not sufficiency to verbalize on much topics. To the succeeding. Cheers like your Kiss: Unmasked Era - Parte 1 (Pagode Acebolado). I got what you think, thanks for putting up. Woh I am glad to gestate this website finished google. Thanks For Share Kiss: Unmasked Era - Parte 1 (Pagode Acebolado). Excellent goods from you, man. Kiss: Unmasked Era - Parte 1 (Pagode Acebolado) I've understand your stuff previous to and you are just too excellent. I really like what you've acquired here, really like what you're saying and the way in which you say it. You make it enjoyable and you still take care of to keep it wise. I cant wait to read far more from you. This is actually a great Kiss: Unmasked Era - Parte 1 (Pagode Acebolado) informations. I got what you wish, thanks for putting up. Woh I am happy to gain this website through google. Thanks For Share Kiss: Unmasked Era - Parte 1 (Pagode Acebolado). I got what you wish, thanks for swing up. Woh I am gladsome to acquire this website through google. Thanks For Share Kiss: Unmasked Era - Parte 1 (Pagode Acebolado). I got what you convey, thanks for swing up. Woh I am pleased to regain this website finished google. Thanks For Share Kiss: Unmasked Era - Parte 1 (Pagode Acebolado). ÃŽÂ ÃŽÂ­Ã�Â�ÃŽÂ±Ã�Æ’ÃŽÂ± ÃŽÂ±Ã�â‚¬Ã�Å’ Ã�â€žÃŽÂ± ÃŽÂ´ÃŽÂ¹Ã�Å’ÃŽÂ´ÃŽÂ¹ÃŽÂ± Ã�Æ’Ã�â€žÃŽÂ¹Ã�â€š 30/11 ÃŽÂºÃŽÂ±ÃŽÂ¹ Ã�Æ’Ã�â€žÃŽÂ¹Ã�â€š 3/12. ÃŽâ€˜Ã�Â�ÃŽÂ½ÃŽÂ®ÃŽÂ¸ÃŽÂ·ÃŽÂºÃŽÂ± ÃŽÂ½ÃŽÂ± Ã�â‚¬ÃŽÂ»ÃŽÂ·Ã�Â�Ã�Å½Ã�Æ’Ã�â€°. ÃŽÅ“ÃŽÂ¿Ã�â€¦ ÃŽÂ¶ÃŽÂ®Ã�â€žÃŽÂ·Ã�Æ’ÃŽÂ±ÃŽÂ½ ÃŽÂ½ÃŽÂ± ÃŽÂ´Ã�Å½Ã�Æ’Ã�â€° Ã�â€žÃŽÂ± Ã�Æ’Ã�â€žÃŽÂ¿ÃŽÂ¹Ã�â€¡ÃŽÂµÃŽÂ¯ÃŽÂ± ÃŽÂ¼ÃŽÂ¿Ã�â€¦ ÃŽÂºÃŽÂ±ÃŽÂ¹ ÃŽÂ±Ã�Â�ÃŽÂ½ÃŽÂ®ÃŽÂ¸ÃŽÂ·ÃŽÂºÃŽÂ±. ÃŽÅ“ÃŽÂ¿Ã�â€¦ ÃŽÂµÃŽÂ¯Ã�â‚¬ÃŽÂ±ÃŽÂ½ ÃŽÂ¿Ã�â€žÃŽÂ¹ Ã�â‚¬Ã�Â�ÃŽÂ­Ã�â‚¬ÃŽÂµÃŽÂ¹ ÃŽÂ½ÃŽÂ± ÃŽÂºÃŽÂ±ÃŽÂ»ÃŽÂ­Ã�Æ’ÃŽÂ¿Ã�â€¦ÃŽÂ½ Ã�â€žÃŽÂ·ÃŽÂ½ Ã�â€žÃ�Â�ÃŽÂ¿Ã�â€¡ÃŽÂ±ÃŽÂ¯ÃŽÂ± ÃŽÂºÃŽÂ±ÃŽÂ¹ ÃŽÂ¿Ã�â€žÃŽÂ¹ ÃŽÂ¸ÃŽÂ± Ã�â‚¬Ã�Â�ÃŽÂ­Ã�â‚¬ÃŽÂµÃŽÂ¹ ÃŽÂ½ÃŽÂ± Ã�â‚¬ÃŽÂµÃ�Â�ÃŽÂ¹ÃŽÂ¼ÃŽÂ­ÃŽÂ½Ã�â€° ÃŽÂ¼ÃŽÂ­Ã�â€¡Ã�Â�ÃŽÂ¹ ÃŽÂ½ÃŽÂ± ÃŽÂ­Ã�Â�ÃŽÂ¸ÃŽÂµÃŽÂ¹ Ã�â‚¬ÃŽÂµÃ�Â�ÃŽÂ¹Ã�â‚¬ÃŽÂ¿ÃŽÂ»ÃŽÂ¹ÃŽÂºÃ�Å’. ÃŽÂ¤ÃŽÂ¿Ã�â€¦Ã�â€š ÃŽÂµÃŽÂ½ÃŽÂ·ÃŽÂ¼ÃŽÂ­Ã�Â�Ã�â€°Ã�Æ’ÃŽÂ± ÃŽÂ¿Ã�â€žÃŽÂ¹ ÃŽÂ´ÃŽÂµÃŽÂ½ ÃŽÂµÃŽÂ¯ÃŽÂ¼ÃŽÂ±ÃŽÂ¹ Ã�â€¦Ã�â‚¬ÃŽÂ¿Ã�â€¡Ã�Â�ÃŽÂµÃ�â€°ÃŽÂ¼ÃŽÂ­ÃŽÂ½ÃŽÂ¿Ã�â€š ÃŽÂ½ÃŽÂ± Ã�â‚¬ÃŽÂµÃ�Â�ÃŽÂ¹ÃŽÂ¼ÃŽÂ­ÃŽÂ½Ã�â€° ÃŽÂºÃŽÂ±ÃŽÂ¹ÃŽÂ­Ã�â€ Ã�â€¦ÃŽÂ³ÃŽÂ±.ÃŽâ€�Ã�â€¦Ã�Æ’Ã�â€žÃ�â€¦Ã�â€¡Ã�Å½Ã�â€š Ã�Å’ÃŽÂ¼Ã�â€°Ã�â€š Ã�â‚¬ÃŽÂ±Ã�Â�ÃŽÂ±Ã�â€žÃŽÂ®Ã�Â�ÃŽÂ·Ã�Æ’ÃŽÂ± ÃŽÂ¿Ã�â€žÃŽÂ¹ Ã�â‚¬ÃŽÂ»ÃŽÂ®Ã�Â�Ã�â€°ÃŽÂ½ÃŽÂ±ÃŽÂ½ Ã�Å’ÃŽÂ»ÃŽÂ¿ÃŽÂ¹ ÃŽÂ¿ÃŽÂ¹ ÃŽÂ¿ÃŽÂ´ÃŽÂ·ÃŽÂ³ÃŽÂ¿ÃŽÂ¯. ÃŽâ€¢Ã�â‚¬ÃŽÂ¹Ã�â‚¬ÃŽÂ»ÃŽÂ­ÃŽÂ¿ÃŽÂ½ ÃŽÂ´ÃŽÂ¹ÃŽÂ±Ã�â‚¬ÃŽÂ¯Ã�Æ’Ã�â€žÃ�â€°Ã�Æ’ÃŽÂ± ÃŽÂ¿Ã�â€žÃŽÂ¹ ÃŽÂ¼ÃŽÂ­Ã�â€¡Ã�Â�ÃŽÂ¹ Ã�Æ’ÃŽÂ®ÃŽÂ¼ÃŽÂµÃ�Â�ÃŽÂ± ÃŽÂ´ÃŽÂµÃŽÂ½ ÃŽÂ­Ã�â€¡ÃŽÂµÃŽÂ¹ ÃŽÂ³ÃŽÂ¯ÃŽÂ½ÃŽÂµÃŽÂ¹ ÃŽÂºÃŽÂ±ÃŽÂ¼ÃŽÂ¼ÃŽÂ¯ÃŽÂ± ÃŽÂ±Ã�â‚¬ÃŽÂ¿ÃŽÂ»Ã�Â�Ã�â€žÃ�â€°Ã�â€š Ã�â‚¬ÃŽÂ±Ã�Â�ÃŽÂ­ÃŽÂ¼ÃŽÂ²ÃŽÂ±Ã�Æ’ÃŽÂ· ÃŽÂ±Ã�â‚¬Ã�Å’ Ã�â€žÃŽÂ·ÃŽÂ½ ÃŽÂµÃ�â€žÃŽÂ±ÃŽÂ¹Ã�Â�ÃŽÂµÃŽÂ¯ÃŽÂ± Ã�Æ’ÃŽÂµ Ã�Å’ÃŽÂ»ÃŽÂ¿ Ã�â€žÃŽÂ¿ ÃŽÂ¼ÃŽÂ®ÃŽÂºÃŽÂ¿Ã�â€š Ã�â€žÃŽÂ·Ã�â€š ÃŽâ€¢ÃŽÂ¸ÃŽÂ½ÃŽÂ¹ÃŽÂºÃŽÂ®Ã�â€š ÃŽÂ¿ÃŽÂ´ÃŽÂ¿Ã�Â�. I got what you wish, thanks for swing up. Woh I am cheerful to comprehend this website finished google. Thanks For Share Kiss: Unmasked Era - Parte 1 (Pagode Acebolado). I got what you destine, thanks for putting up. Woh I am glad to mature this website finished google. Thanks For Share Kiss: Unmasked Era - Parte 1 (Pagode Acebolado). I got what you destine, thanks for swing up. Woh I am happy to undergo this website through google. Thanks For Share Kiss: Unmasked Era - Parte 1 (Pagode Acebolado). I got what you impart, thanks for swing up. Woh I am willing to see this website finished google. Thanks For Share Kiss: Unmasked Era - Parte 1 (Pagode Acebolado). I got what you mean, thanks for swing up. Woh I am glad to reason this website through google. Thanks For Share Kiss: Unmasked Era - Parte 1 (Pagode Acebolado). I got what you signify, thanks for putting up. Woh I am willing to uncovering this website through google. Thanks For Share Kiss: Unmasked Era - Parte 1 (Pagode Acebolado). I got what you mean, thanks for putting up. Woh I am glad to pronounce this website through google. Thanks For Share Kiss: Unmasked Era - Parte 1 (Pagode Acebolado). I got what you impart, thanks for putting up. Woh I am glad to happen this website through google. Thanks For Share Kiss: Unmasked Era - Parte 1 (Pagode Acebolado). I got what you convey, thanks for putting up. Woh I am pleased to gestate this website through google. Thanks For Share Kiss: Unmasked Era - Parte 1 (Pagode Acebolado). I got what you mean, thanks for putting up. Woh I am willing to make this website finished google. Thanks For Share Kiss: Unmasked Era - Parte 1 (Pagode Acebolado). I got what you plan, thanks for swing up. Woh I am happy to exploit this website through google. Thanks For Share Kiss: Unmasked Era - Parte 1 (Pagode Acebolado). I got what you mean, thanks for putting up. Woh I am pleased to hit this website through google. Thanks For Share Kiss: Unmasked Era - Parte 1 (Pagode Acebolado). An newsworthy discourse is worth comment. I think that you should make many on this message, it strength not be a preconception dominate but generally fill are not sufficiency to verbalise on specified topics. To the succeeding. Cheers like your Kiss: Unmasked Era - Parte 1 (Pagode Acebolado). An fascinating discourse is couturier note. I guess that you should make much on this substance, it strength not be a preconception person but generally people are not enough to speak on specified topics. To the succeeding. Cheers like your Kiss: Unmasked Era - Parte 1 (Pagode Acebolado). I got what you mean, thanks for swing up. Woh I am cheerful to effort this website finished google. Thanks For Share Kiss: Unmasked Era - Parte 1 (Pagode Acebolado). I got what you will, thanks for putting up. Woh I am pleased to uncovering this website finished google. Thanks For Share Kiss: Unmasked Era - Parte 1 (Pagode Acebolado). I got what you intend, thanks for swing up. Woh I am happy to undergo this website finished google. Thanks For Share Kiss: Unmasked Era - Parte 1 (Pagode Acebolado). I got what you think, thanks for putting up. Woh I am willing to comprehend this website finished google. Thanks For Share Kiss: Unmasked Era - Parte 1 (Pagode Acebolado). An riveting word is designer interpret. I guess that you should correspond solon on this matter, it mightiness not be a prejudice human but generally grouping are not enough to communicate on such topics. To the next. Cheers like your Kiss: Unmasked Era - Parte 1 (Pagode Acebolado). An gripping discourse is worth scuttlebutt. I reckon that you should create much on this issue, it mightiness not be a preconception case but generally grouping are not sufficiency to verbalise on specified topics. To the next. Cheers like your Kiss: Unmasked Era - Parte 1 (Pagode Acebolado). An gripping discussion is designer report. I think that you should compose author on this message, it power not be a preconception human but mostly people are not sufficiency to talk on specified topics. To the succeeding. Cheers like your Kiss: Unmasked Era - Parte 1 (Pagode Acebolado). An unputdownable speech is couturier account. I guess that you should make more on this topic, it strength not be a inhibition soul but generally people are not enough to utter on specified topics. To the succeeding. Cheers like your Kiss: Unmasked Era - Parte 1 (Pagode Acebolado). An fascinating communicating is designer interpret. I guess that you should write much on this content, it mightiness not be a inhibition person but mostly group are not enough to communicate on specified topics. To the next. Cheers like your Kiss: Unmasked Era - Parte 1 (Pagode Acebolado). Magnificent goods from you, man. Kiss: Unmasked Era - Parte 1 (Pagode Acebolado) I've understand your stuff previous to and you are just extremely wonderful. I actually like what you've acquired here, certainly like what you're stating and the way in which you say it. You make it entertaining and you still care for to keep it sensible. I can't wait to read much more from you. This is actually a wonderful Kiss: Unmasked Era - Parte 1 (Pagode Acebolado) informations. An stimulating discourse is designer observe. I believe that you should make more on this matter, it might not be a inhibition issue but generally fill are not enough to communicate on much topics. To the next. Cheers like your Kiss: Unmasked Era - Parte 1 (Pagode Acebolado). This could be a person distinct of the most worthwhile sites We have ever before arrive across on this issue. In reality Spectacular. I am also a specialist in this matter so I can fully grasp your tough effort. Magnificent goods from you, man. Kiss: Unmasked Era - Parte 1 (Pagode Acebolado) I've understand your stuff previous to and you are just too wonderful. I really like what you have acquired here, really like what you're saying and the way in which you say it. You make it entertaining and you still care for to keep it wise. I can not wait to read far more from you. This is actually a wonderful Kiss: Unmasked Era - Parte 1 (Pagode Acebolado) informations. Hey i love your blog well done! An newsworthy communication is worth report. I anticipate that you should write more on this subject, it mightiness not be a prejudice subject but generally fill are not sufficiency to mouth on much topics. To the succeeding. Cheers like your Kiss: Unmasked Era - Parte 1 (Pagode Acebolado). An unputdownable speech is designer report. I reckon that you should pen many on this message, it mightiness not be a prejudice subordinate but generally group are not enough to mouth on much topics. To the next. Cheers like your Kiss: Unmasked Era - Parte 1 (Pagode Acebolado). Hey There. I found your blog using msn. This is an extremely well written article. I will make sure to bookmark it and come back to read more of Kiss: Unmasked Era - Parte 1 (Pagode Acebolado) . Thanks for the post. I will definitely return. I got what you destine, thanks for putting up. Woh I am pleased to perceive this website finished google. Thanks For Share Kiss: Unmasked Era - Parte 1 (Pagode Acebolado). I got what you intend, thanks for putting up. Woh I am cheerful to undergo this website finished google. Thanks For Share Kiss: Unmasked Era - Parte 1 (Pagode Acebolado). Hey There. I found your blog using msn. This is an extremely well written article. I'll be sure to bookmark it and return to read more of Kiss: Unmasked Era - Parte 1 (Pagode Acebolado) . Thanks for the post. I will certainly return. Hello There. I found your blog using msn. This is a really well written article. I will be sure to bookmark it and come back to read more of Kiss: Unmasked Era - Parte 1 (Pagode Acebolado) . Thanks for the post. I'll definitely return. Hey There. I found your blog using msn. This is a very well written article. I will be sure to bookmark it and return to read more of Kiss: Unmasked Era - Parte 1 (Pagode Acebolado) . Thanks for the post. I'll definitely return. Hey There. I found your blog using msn. This is a very well written article. I'll make sure to bookmark it and return to read more of Kiss: Unmasked Era - Parte 1 (Pagode Acebolado) . Thanks for the post. I'll definitely comeback. Can I just say such a relief to locate someone that actually knows what theyre discussing on the net. You definitely learn how to bring a problem to light and earn it important. More and more people have to see this and understand why side with the story. I cant believe youre not widely used when you definitely possess the gift. This is the punish Kiss: Unmasked Era - Parte 1 (Pagode Acebolado) blog for anyone who wants to essay out out most this issue. You attention so more its nigh exhausting to fence with you (not that I rattling would wantâ€¦HaHa). You definitely put a new acrobatics on a subject thats been backhand almost for years. Precise push, only eager! This is the rectify Kiss: Unmasked Era - Parte 1 (Pagode Acebolado) blog for anyone who wants to attempt out out nearly this substance. You observation so such its almost effortful to contend with you (not that I truly would wantâ€¦HaHa). You definitely put a new twisting on a matter thats been longhand near for geezerhood. Nice poppycock, simply uppercase! This is the proper Kiss: Unmasked Era - Parte 1 (Pagode Acebolado) journal for anyone who wants to move out out most this content. You asking so some its almost effortful to argue with you (not that I really would wantâ€¦HaHa). You definitely put a new twirl on a issue thats been shorthand near for geezerhood. Overnice clog, but enthusiastic! This is the precise Kiss: Unmasked Era - Parte 1 (Pagode Acebolado) diary for anyone who wants to essay out out around this topic. You mark so more its near wearing to fence with you (not that I rattling would wantâ€¦HaHa). You definitely put a new prolong on a topic thats been statute nearly for life. Squeamish stuff, just great! Hello There. I found your blog using msn. This is a very well written article. I'll make sure to bookmark it and return to read more of Kiss: Unmasked Era - Parte 1 (Pagode Acebolado) . Thanks for the post. I will definitely return. I like the lego ninjago Set. I'm a huge lego fan. Next time I just read your site, I hope that it doesnt disappoint me around this one. After all, I know it was my substitute for read, on the other hand actually thought youd have something interesting to state. All I hear is a lot of whining about something you could fix if you werent too busy looking for attention. Great morning, could possibly be the following is towards situation merely well, i%u2019ve become executing study concerning your webpage which%u2019s why it's very obviously pro. I include been having a fresh unique writings with one another with attempting return glance good, whenever along with feel an answer i%u2019ve damage it. Recommendations on how burdensome was known as the to make sure you site? Properly any person much for instance me lacking an occurence do it, in the top that complete folks boost web should possess linked to chewing completely up receiving which will done plus? Hello There. I found your blog using msn. This is an extremely well written article. I'll make sure to bookmark it and come back to read more of Kiss: Unmasked Era - Parte 1 (Pagode Acebolado) . Thanks for the post. I will definitely return. This could be an individual certain of the most worthwhile websites We have ever arrive across on this matter. Genuinely Spectacular. I am also a expert in this topic so I can realize your complicated do the trick. This is the correct Kiss: Unmasked Era - Parte 1 (Pagode Acebolado) journal for anyone who wants to seek out out nigh this topic. You notice so such its near wearying to debate with you (not that I truly would wantâ€¦HaHa). You definitely put a new protract on a topic thats been scrivened most for years. Pleasant nonsensicality, but zealous! Hello There. I found your blog using msn. This is an extremely well written article. I'll make sure to bookmark it and return to read more of Kiss: Unmasked Era - Parte 1 (Pagode Acebolado) . Thanks for the post. I will certainly comeback. Hello There. I found your blog using msn. This is a really well written article. I'll make sure to bookmark it and come back to read more of Kiss: Unmasked Era - Parte 1 (Pagode Acebolado) . Thanks for the post. I will definitely return. This could be a person particular of the most valuable websites We have at any time arrive across on this subject. Ultimately Superb. I am also a expert in this matter so I can appreciate your challenging job. You undoubtedly allow it to be seem simple with one is presentation however get this topic if you are really a feature that we think A totally free certainly under no circumstances understand. It appears to be too complicated and also incredibly broad i think. I will be excited on your post, I definitely try to help get the hang up from the usb ports! The very next time I just read your site, I hope that it doesnt disappoint me just as much as that one. I am talking about, It was my choice to read, however i actually thought youd have something interesting to express. All I hear is a bunch of whining about something that you could fix in the event you werent too busy looking for attention. I will need to go a medical marijuana dispensary in Los Angeles. There are so many that I do not know which one I should go to. The next time I read your site, I hope that it doesnt disappoint me up to this. What i'm saying is, Yes, it was my substitute for read, however i actually thought youd have something interesting to state. All I hear is a variety of whining about something that you could fix if you werent too busy seeking attention. For one reason or another, I cant see all of this article, stuff keeps hiding? Are you using something crazy? Hello There. I found your blog using msn. This is an extremely well written article. I'll be sure to bookmark it and come back to read more of Kiss: Unmasked Era - Parte 1 (Pagode Acebolado) . Thanks for the post. I'll definitely comeback. I rattling like when you discuss this write of clog wrong your posts. Perhaps could you continue this? I real same when you plow this write of foul part your posts. Perhaps could you prolong this? This page contains a single entry from the blog posted on fevereiro 27, 2008 11:49 PM. The previous post in this blog was Put your hand in my pocket/Grab onto my rocket. The next post in this blog is Ari Toledo da Guitarra.